I came into possession of our family slides a few years ago. There are approximately 250 Kodak 35mm slides, housed all these years in a typical metal slide case. Passed around the family, they needed a permanent keeper: a keeper of the vacation to California, someone to look again at the snapshots of the house being built, or clean laundry on the line, as well as all those Christmas mornings. Looking through the memories, I loved seeing pictures of my mom as a little girl playing with her four brothers. Mom’s pretty blonde hair all done up prim and proper for her dance recital or disheveled from “horsing around” with the boys. You can see in them as children the adults they were to become. I was taken in by the old dusty film and saw the artistic potential they held. My grandmother, now eighty-six, often recounts for me the happenings of each captured moment. I listen with intent and record with paint those memories. 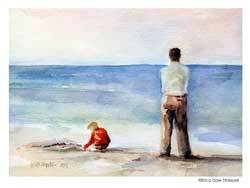 Beachcomber is one of my favorite compositions from this series I call Memories Revisited. 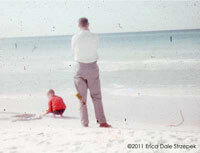 In the original slide, the elements of calm quiet shore colors, people not in beach attire standing oddly in thought with the juxtaposition of the bright orange sweater, spoke to me artistically. The young boy is the oldest of my four uncles and standing next to him is my grandfather. The overall simplicity, yet thoughtfulness of the piece I find to be very inspirational. My watercolor composition stays true to the faded coloring of the vintage slide. Soft sand, with calm sea water and cloudless sky. The man stands tall, in an almost absent composure while the child plays. I have kept their nontraditional beach attire, letting the viewer work out their own reasoning. The quiet thoughtfulness in each of them still a mystery.